Place shrimp in a bowl with brine mixture and refrigerate for 20 to 25 minutes. 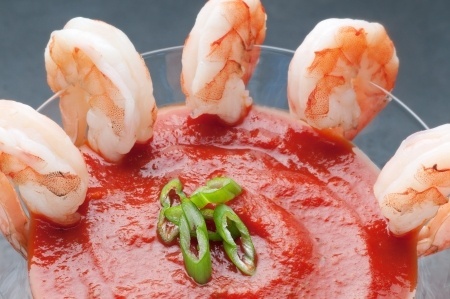 While shrimp are brining, make cocktail sauce and refrigerate. Place a baking sheet or broiler pan under oven broiler and preheat for 5 minutes. Remove shrimp from brine and drain thoroughly. Rinse the shrimp under cold water and dry on paper towels. In a large bowl, toss shrimp with olive oil and sprinkle with salt and pepper, if desired. Place shrimp onto a sizzling sheet pan and return to broiler immediately. After 2 minutes, turn the shrimp with a pair of tongs. Return the shrimp to broiler for 1 minute or until shrimp are pink and cooked through. Be careful not to overcook them, so watch them carefully. Transfer to a cold cookie sheet to cool. Refrigerate immediately.